With a ton of extra radishes on hand last week, I debated on what to do with them. Since I was planning on making some homemade deli sandwiches later that weekend, I decided to try my hand at making some homemade pickled radishes to go with them. I am SO glad I did this! These spicy pickled radishes were AMAZING! And the best part was that the pickling was so easy. This is a no-cook pickling recipe, so it literally took me all of 5 minutes to prepare this. Then I just put the jar in the fridge and let the recipe work it’s magic. So simple, yet so delicious. The red coloring of the skin does dissolve in the vinegar creating a pink brine, so just be aware of that when you make them. It’s totally normal and expected. I wanted mine spicy, so I used some sliced jalapenos in my brine, but if you want a more mild version, try using celery or bell peppers instead. Or get creative and add in any kind of peppers you want! Next time, I may add some dill or bay leaves too. But for my heat loving appetite, my spicy pickled radishes recipe was perfect as is. I could seriously NOT stop eating them. I’ve already gone through two jars! I may need an intervention soon. If you like all things pickled, this low calorie recipe is a must! These mouthwatering spicy pickled radishes are incredible on salads, sandwiches or even to be eaten alone. They are the perfect low calorie pickled treat to satisfy your craving for something crunchy and sour. 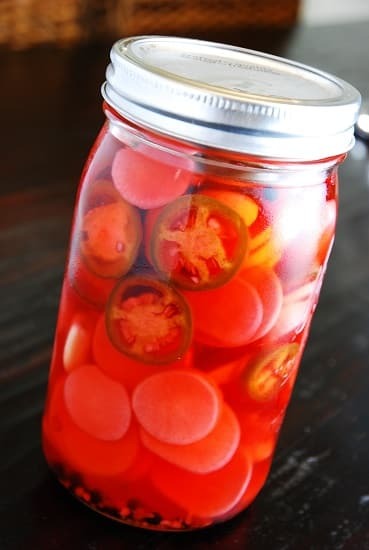 In a large, wide mouthed mason jar, layer the radishes, garlic cloves and jalapenos. Add in salt, peppercorns and sugar, and then pour in the vinegar. Depending on how your jar is, you may or may not use the full two cups of vinegar. You may even use a bit more. Either is ok.
Cap your mason jar tightly and shake well to combine. Marinate in refrigerator for at least 1-2 days. With a small empty spot in the garden, I now know what to put there. I love radishes, but never think to grow them. If they turn out to be as good as they look, I will also process some for winter use. Thank you for this. Thankful radishes grow so quickly. Could I use pickled jalapenos since that’s all I have on hand, or would you definitely reccommend using fresh peppers? You can use pickled, but since they are already soaked in a brine, they won’t give off much flavor and spice. Fresh jalapenos will release their oils and deliver a major impact in the taste. sounds yummy/addictive! What kind of vinegar do you reccomend? I used just plain old white vinegar.